Since I am still waiting for my archival boxes and sleeves to start organizing my hundreds of family photos, I decided to go ahead and start on my family slides. Remember when slides were the rage? That was back in the 60s, 70s and even into the 80s, then their popularity died out. I don't know about you but I have hundreds of slides and it's time I did something with them. The longer they are left the more they deteriorate. Besides who has a slide viewer anymore? One problem is that my slides are not organized by event, date or any other criteria. You can see from my photo that some are in slide boxes and others are just loose. To start my organization I bought a nifty little piece of equipment - the Jumbl Scanner & Digitizer. It scans slides and negatives and digitizes them to a memory card or the Jumbl internal memory. You can use an external power source or you can plug it into your computer via USB and use your computer power. It's on sale right now on Amazon. I am loving mine! It's easy and fast. If you want to grab one just use the link below. To begin my organization and preservation of my slides I decided my first step was to scan them all and organize the digital files later. The box on the right of this photo are the slides I have scanned in the last 3 days. I only work for an hour at a time as the repetitive motion of inserting and removing the slides is hard on my bad shoulder due to a rotator cuff problem. Once scanned and saved to a memory disc I insert the disc into my computer and transfer the scans to Picasa. Then I rename them, make any adjustments in contrast that I want, crop any dark edges (this only happens when I don't insert the slide accurately), and rotate them if they are sideways or upside down. Jumbl has editing capabilities but I prefer to use Picasa. A few of the slides were noticeably backwards (spotted due to backwards writing on signs) so I flip those horizontally using a program called Gimp. You can use almost any graphic program to do this but I work on a Mac and have my favourites that I am used to. It's a good idea to work out your naming system for the scanned slides before you start renaming them. I like to name mine as Surname_FirstName_Year_Event. I also add names of other individuals either in the file name if not too lengthy or in the Comments section of the Information part of the photo. 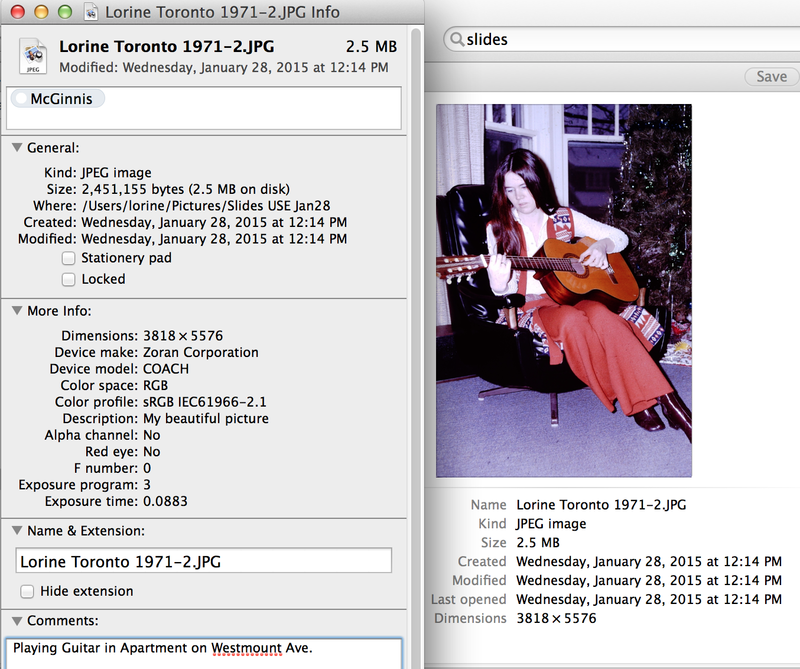 The photo on the right shows my digitized scanned slide of me playing guitar in 1971. I tagged the image with my maiden name and added some detail in the Comment setion. I didn't put my maiden name in the file name as it changed with marriage, so I prefer to just use my first name in this case. For those who might notice the Description "My beautiful picture", my husband put that! I'm very pleased with the quality of the scans. I uploaded some to my Facebook page and my family seems very pleased to see photos of themselves or deceased loved ones from the 60s and 70s. Don't wait to start saving your treasured family slides. In the lead up to Valentine's Day, we thought it would be fun to hear some inspiring love stories from your family, relatives or even friends you know. Just a great way to warm up the cold winter months with some inspiring and heart-warming stories. I submitted the story of my mother and her second husband Godfrey. 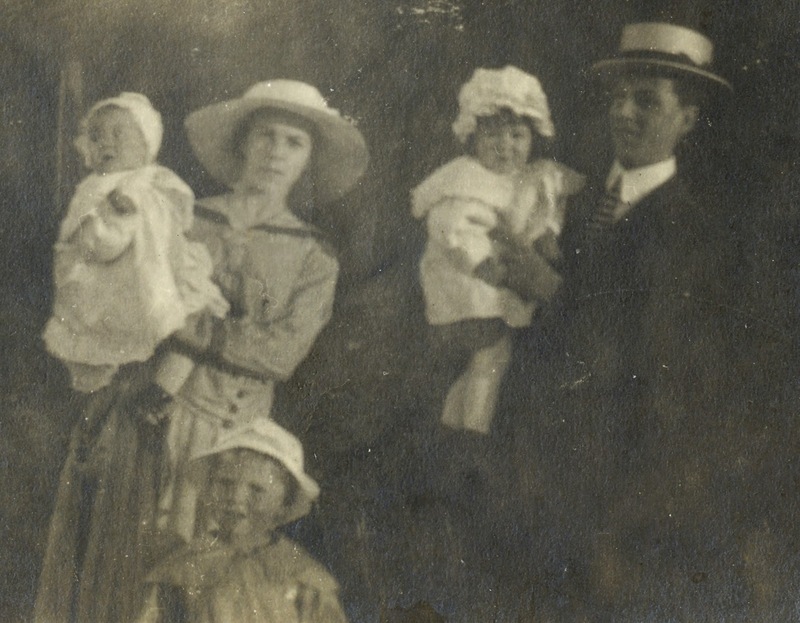 They met in 1916 when mother was a few months old and were often together as children. As a teenager Godfrey lived with my mother's parents and fell in love with her. He left town without telling her because he wanted to find work, save his money and come back and propose. When he came back my mother was engaged to my father so once again Godfrey left without saying a word. They lost touch after that. 50 years later in 1985 they accidentally ended up in the same town in Florida for the winter and after Godfrey's wife died, he confessed his love for my mother. She then confessed that she too had loved him way back in 1934. They were together from that date until Godfrey's death in 1995. Do you have a story to tell? Why not submit it to Crestleaf? It's a fun activity! Keeping your genealogy research safe and sound is important. I've been thinking a lot about how and where genealogists should be backing up their computer files and reached out to iDrive to see if they could help. I'm very pleased to say they agreed to provide an exclusive deal for followers of Olive Tree Genealogy! iDrive is easy to install and easy to use. There's no learning curve and you can start protecting your years of genealogy research immediately. The Canadian Military Heritage Project recently added a Diary and Letters kept by Moise Godin during the Nile Expedition of 1884. It's a fascinating account of a Canadian boatman who joined hundreds of Canadians to take barges down the Nile River. 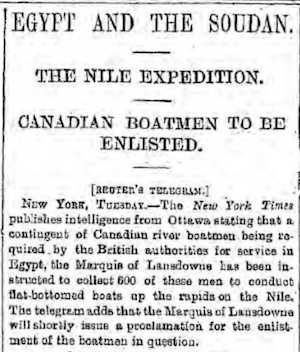 The Nile Expedtiion was the first instance of overseas service of Canadians. In 1884, during the Battle of Khartoum in the Sudan, the British put out a call for Canadian volunteers to help guide British soldiers up the Nile River. The soldiers were to provide some relief to the isolated men stationed there. Have you ever noticed that friends and family react in different ways when you start to relate a genealogy story or find? In my family most are mildly interested if it's a good story about a rogue or an ancestor who did something exciting. They don't want to hear about 3rd great grandpa Joe who was a farmer his whole life or how I can't find Great Great Grandma Harriet's maiden name. There are a couple of my family members who tell me bluntly they aren't interested. At all. Not one little bit. This is usually followed by a yawn. How many ask me what new things I've found? Zero. None. I will admit that there are a couple who say the right things "Oh that's cool!" "Wow, good stuff!" but I know they're just being kind. And that's okay because at least I feel like my hard work over the last 30+ years hasn't been totally in vain. I do wish there were one or two family members who cared, perhaps not as passionately as I do, but who showed more than a passing interest. I'd love to share genealogy discoveries with them. I'd enjoy chatting about brick walls, or brainstorming how to move ahead with a challenging ancestor. However I count myself lucky to have a husband who shares my love for genealogy and family history. He listens, He enjoys brainstorming sessions. He understands and accepts that if I'm deep into census or church records, I am not stopping to make supper. 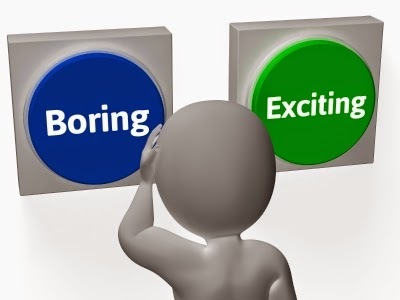 What kind of reactions do you get in your family? Recently I purchased 35 loose Cabinet Cards and CDVs (Cartes de Visite) that had been removed from an old photo album and were up for sale. Every photo except one was clearly identified and I had a bit of fun yesterday scanning the photos and researching the family. This is one of the photos. It's a really lovely photograph of two children, almost certainly brother and sister. They are labelled in period handwriting "Edmon & Fannie". This is the only identified photo that does not include a surname. Because little Edmon is wearing a dress, we know he is a toddler and not toilet-trained, so probably around 2 years of age. The photo is a CDV with rounded corners and this can help date it. 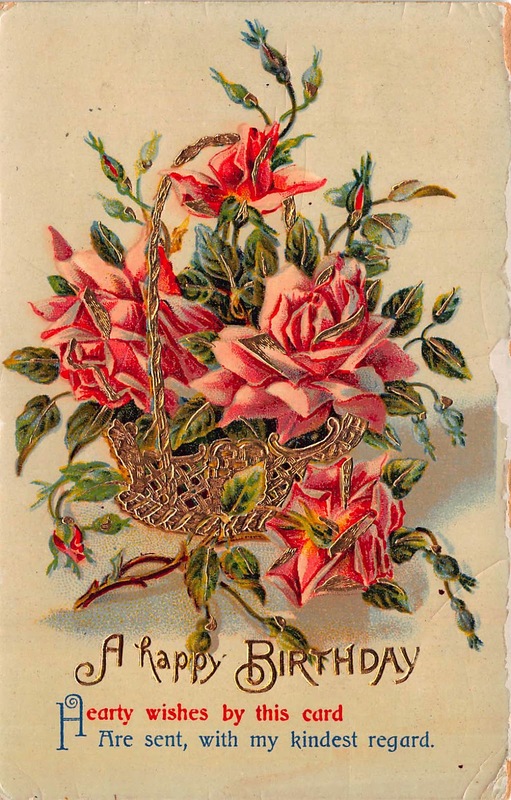 Rounded corners on CDVs did not begin until 1872. Studying the photographer's mark on the verso of this CDV and finding out when M. Smith was in business, as well as studying the clothing styles, children's hair and other clues would allow this photo to be dated with some precision. From my research yesterday it appears the photos may all connected through family relationships. For example there are 5 photos of brothers and sisters of the Williams family of Bridgeport Connecticut. 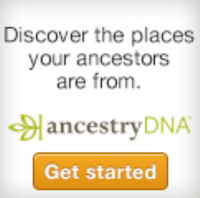 This became evident as I searched census records on Ancestry.com . I believe, but have not yet proven. that 2 other Williams photos are of wives of two of the brothers. The Williams family consisted of Benjamin Williams and his wife Elizabeth Goss. 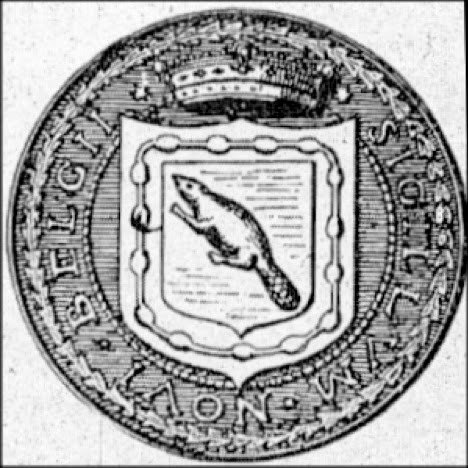 Benjamin was born in Maine and Elizabeth in New Brunswick Canada. All the children were born in New Brunswick. The photos I have are of the siblings Simeon, Orlo, Hartley, Eva and Samuel. There are photos of the Deniger family, also of Bridgeport. Joseph Henry Deniger and his sister Gertrude are two that I have found so far. 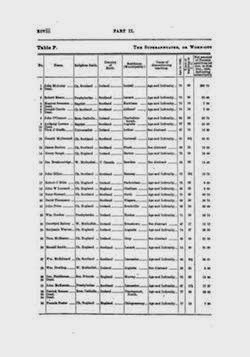 Interestingly, their father Joseph Deniger Sr. was born in Canada and their mother Harriet was a Chatfield before her marriage. In the group of photos is one labelled "Uncle Lew Chatfield" and I found 21 year old Lewis Chatfield living with Joseph Deniger Sr in 1860 in Bridgeport. Sixteen of the photos were taken in Bridgeport Connecticut. 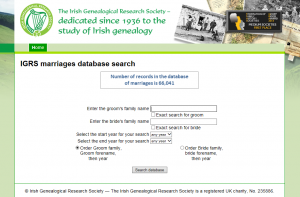 With so many parishes in Ireland not having any register of marriages before the 1840s, the database is fast becoming an invaluable tool in identifying where and when ancestors tied-the-knot. It includes references from a myriad of different sources: books, gravestones, family bibles, deeds, wills, letters, court records, published journals, newspapers, census transcripts and old age pensions forms, to name just a few. Sources drawn upon for this particular update include marriage licence bonds from a number of diocese covering all or parts of counties Carlow, Kildare, Kilkenny, Laois, Longford, Offaly, Roscommon, Sligo, Westmeath, Wexford and Wicklow; and there are further references to marriages from the Registry of Deeds. I would like to find a home for the attached dog tag. My father ran a wrecker service in DeKalb, Illinois and found this in a car many years ago. 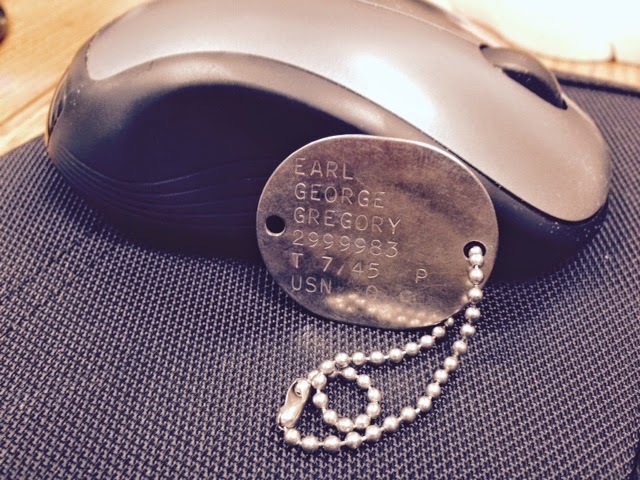 It is for Earl George Gregory. Find-A-Grave shows his wife as Anna, buried with him. If you can help find Earl's family, we can add this to our solved cases with a happy ending. There is probably a family member who would treasure this item, let's help find Earl's family and send it home. I have scanned and added more of these postcards to Lost Faces and will be adding the rest of these wonderful cards over the next month. I hope descendants will see these postcards and recognize an ancestor. What Happens To Your Genealogy Research When You're Gone? Have you thought about what will happen to your genealogy research after you are gone? I don't know about you but I have several filing cabinets full of genealogy papers and records that I have compiled over the years. It's unlikely that any one person would be willing to take all these home and start going through them. Often there is only one genealogy addict for each generation. I'm the one in my generation and have been for over 30 years. That means no one else is very interested. Oh sure they like the occasional interesting story of an ancestor but to scroll through reel after reel of microfilm or puzzle over a census record for clues - nope. After we've done all that work for the past 10 or 20 or 30 years, it is human nature to want to see it passed on and not discarded as if it had no meaning or importance. Perhaps you have an appointed person who will pick up the torch and carry on after your demise. But even if there is one person you hope will do this, do you think they really want your boxes or drawers full of papers to sort through? I'm an avid genealogist and can never get enough. But when my mother died I took 4 filing cabinet drawers full of her genealogy research and put them in boxes to bring home. I've never gone through it and it's been 6 years. Every time I look at the boxes full of miscellaneous notes and papers and records I am overwhelmed at the task of sorting, analyzing and figuring out what to keep and what to toss. So what's the solution? How do we find and prepare a suitable torch-bearer and how can we get our genealogy research into a state that will make it easy for the next generation to carry on? Each book is about one family. I like to keep them 25 pages or less and they are meant to highlight the family with stories, photos and some of the documents I have obtained. For my McGinnis family I created 4 different volumes, one for each generation starting with mine. These are given to each of my children in hopes that they will find their way down to my grandchildren and perhaps continue to be passed on. The second method I'm working on is putting all my copies of original records - vital registrations, wills, census and so on, into binders (one per family) which also contain a pedigree chart for that family. In my mind it is a summary of the family with documentation and I am hopeful it is something that anyone remotely interested in the genealogy would be happy to take to their home and keep. I also am currently working on getting all these papers digitized, put on flash drives and given to my children. That's a big job and it's not high on my list since technology changes so quickly the day will almost certainly come when the data cannot be retrieved. Remember those big floppy discs for computers? Or the smaller ones? Who can read them now? Digitizing the papers is important though because then you can save them in the cloud and on your computer. It's a great back-up method for your work but I don't see it as viable for passing on to family. Don't be fooled into thinking the local genealogy society or library or museum will want your papers. They may happily accept a book about your families but loose papers are unlikely to be given a home. What's your plan? Share your ideas here and let's see what plans and projects we can come up with. A little known source for information regarding teachers in early Ontario Canada is the series of booklets called "Annual Report of the Minister of Education, on the Public, Separate, and High Schools, Also on the Normal and Model Schools, of the Province of Ontario"
Recently I rescued 28 vintage orphaned postcards from antique shops. They range in date from 1900 to 1918. 27 are from United States and 1 is from Ontario Canada. I have scanned and added 6 of these postcards to Lost Faces and will be adding the rest of these wonderful cards over the next month. I hope descendants will see these postcards and recognize an ancestor. 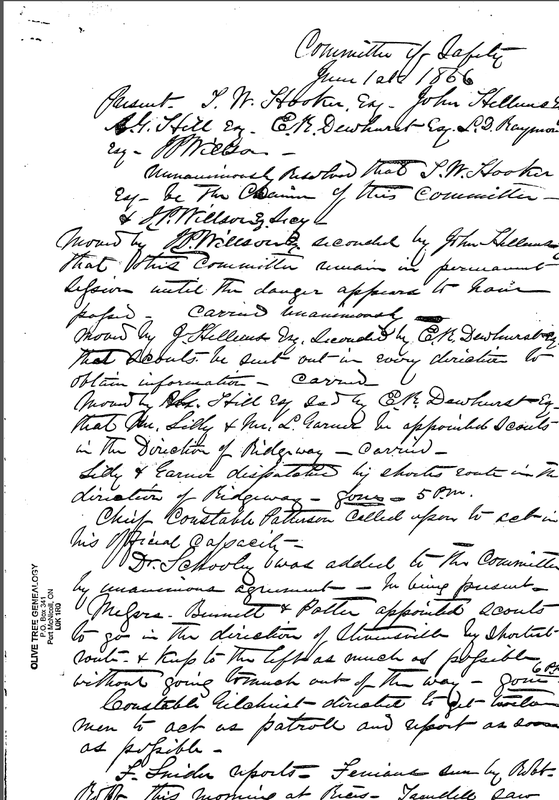 The minutes of the Committee of Safety were found by Barbara Wilson Smith, a descendant of Isaac P. Willson (Secretary of the meeting). These unpublished and previously unknown documents from 1866 (6 numbered legal size pages plus 3 unnumbered letter size!) had sat in an attic for over 130 years. They turned out to be the minutes of a 17 hour meeting (beginning at 5 p.m. June 1st, ending at 10 a.m. June 2) in the Welland area of Ontario in the 24 hours preceding the Battle of Ridgeway! 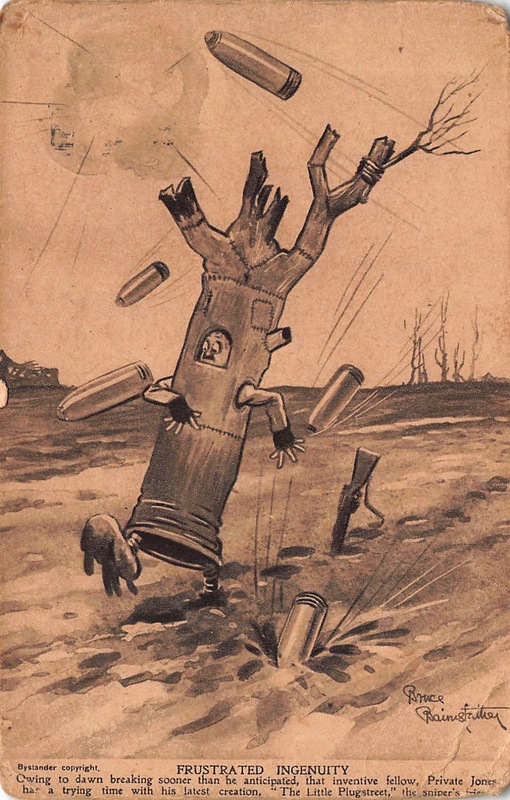 These are extremely important historical documents from the Fenian Raids. See the full documents at Committee of Safety Meeting page on Olive Tree Genealogy website. These include 2 pdf files of the Committee Meeting of Safety and the list of men in the Volunteer Patrol Guards. 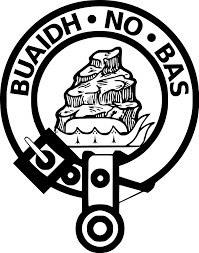 For centuries the MacNeil clan living on the Hebridean island of Barra have proudly claimed to be descendants of Ireland's greatest King, Niall of the Nine Hostages. However DNA testing has proven this story a myth. DNA swabs taken from Barra MacNeils as far away as Canada and Australia have shown no trace of Irish ancestry. Instead the DNA indicates Viking (Norse) ancestors. 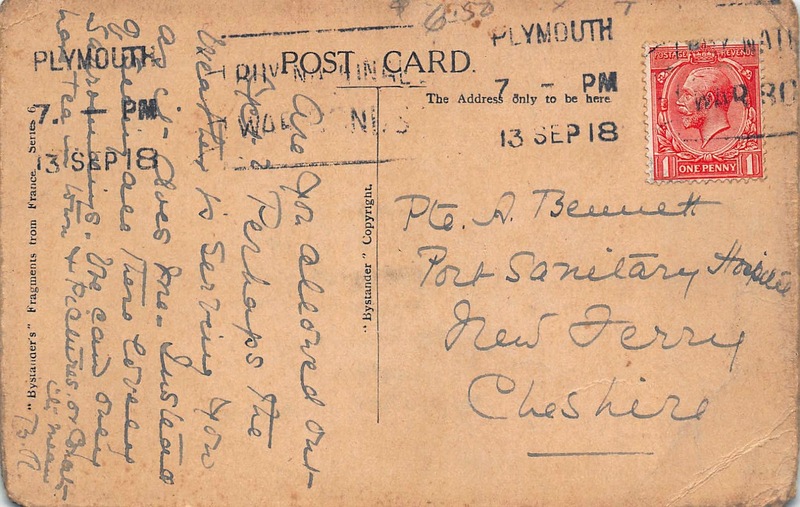 Olive Tree Genealogy has added the diary of WW1 soldier Herbert Kearse to the Canadian Military Heritage Project website. Herbert Kearse was born August 27, 1888 in Burford England. He moved to Burlington Ontario in October 1910. On September 3, 1915 he enlisted in the CEF (Canadian Expeditionary Force). His unit was the 86th Battalion. Herbert became a Lance Corporal in charge of a Lewis Gun Crew and was killed on April 28, 1917. He left a wife and two young songs. His diary began September 13, 1915 and ends 6 days before his death in 1917. The complete diary is published with permission of the owner and is available online for your personal use. A few days ago I began my plan to sort, organize and digitize my family photos. 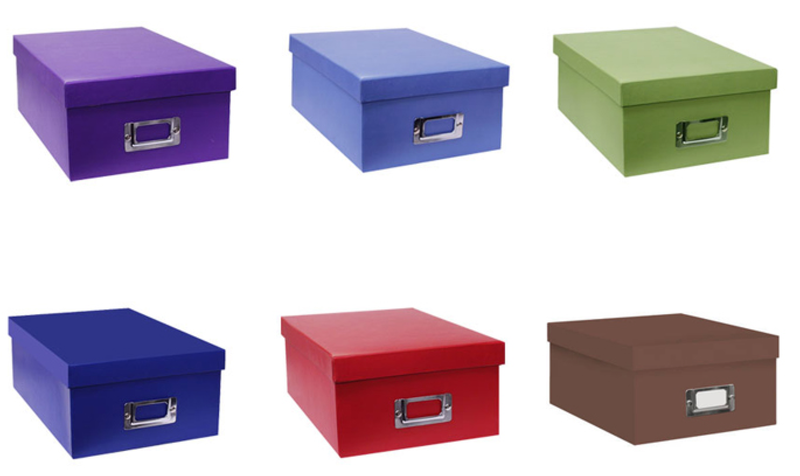 I ended up ordering archival boxes and sleeves from a company called GetSmartProducts. A friend in Colorado used them and was satisified and since it is difficult to find an online company that will ship such items to Canada, I took the leap. Although the items will be some time reaching me, I was impressed when the company phoned me to say they were out of stock on some items. I had a choice - they would ship as the items were available, or hold until they could send as one shipment. 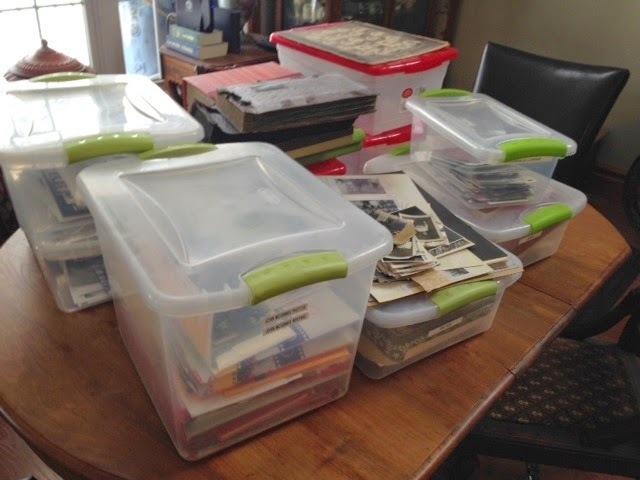 Since it looks like it will be 4 to 6 weeks before my items arrive, I went on to my next organizational project which was sorting my mother's trip diaries, scanning them and sharing them with other family members. Let me explain first that my mother began going on small trips the year she retired at age 55. She always was an adventurer. 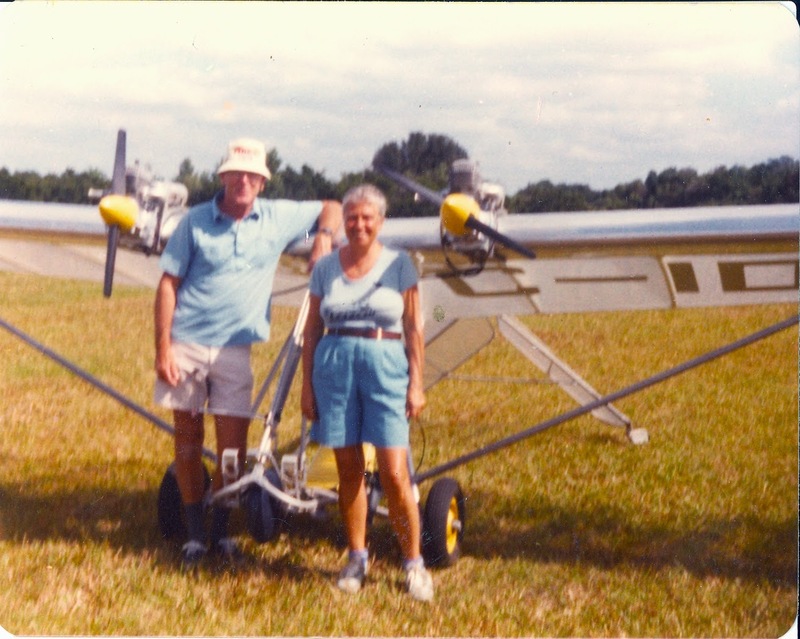 At age 65 she took flying lessons, and built an ultra-light with her partner. 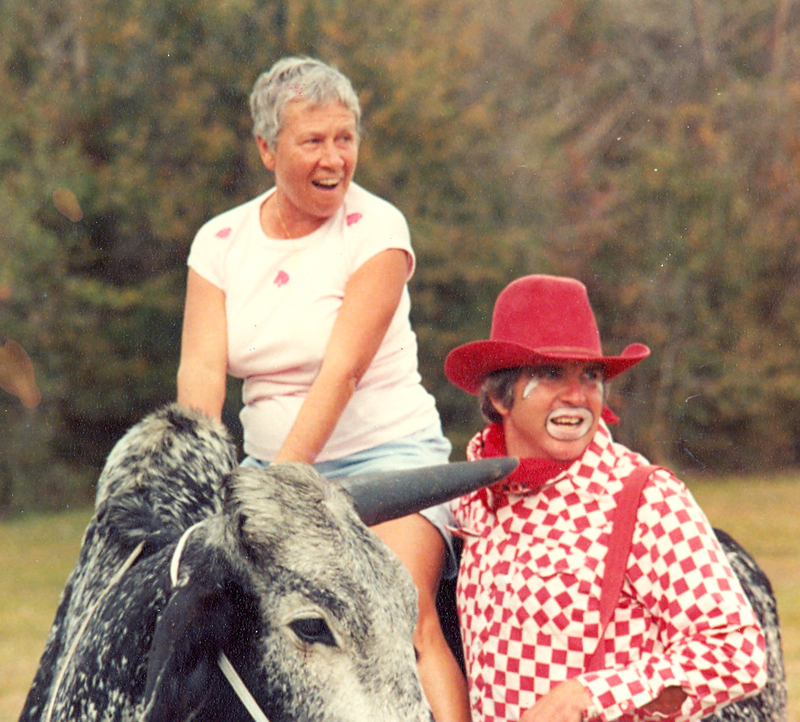 Then just before her 80th birthday she decided she was going to embark on some adventures. Her first big trip was to Australia where she backpacked around with only a small Barbie Doll backpack she picked up at a local Wal-Mart store in Canada. I compiled, as best I could, a list of her various trips and the years she took them. She usually travelled alone as she preferred not having to consult with anyone else about what to see and do each day. 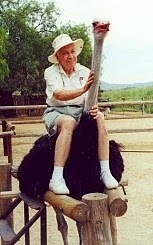 In her years of travel (her last trip was in 2001 at the age of 85) she visited many countries. I would not be surprised if the list below has some trips missing. She often impulsively took what she called "little trips" without telling any of her children! My first step was to go through her hand-written journals and photocopy the pages. Since she wrote in small day-planners I then had to cut and paste to put several days on to one page. Then I photocopied those cut and paste pages. Next I created "cover" sheets which gave the date and the name of the trip. Mother had also typed up notes (not the same as her diary entries) and these were on her computer. I printed those off and figured out what went where, then sorted everything chronologically. This morning I used my document feed scanner, the Fujitsu ScanSnap S1500M Instant PDF Sheet-Fed Scanner , and created 6 pdf files of Mother's trips - 20 pages each. This scanner is awesome. I can't praise it enough. It's one of the best technical items I ever purchased. Next I will send the pdf files to my family members who want copies. I am going to mail the printed copies (after I bind them as a book) to my mother's younger sister who is 92 years old. I know she'll enjoy reading them especially because she accompanied my mother on two of her many trips. I plan on next copying mother's daily diaries that she kept when she was not on a trip. It feels good to finally bring some organization and preservation to these treasured family diaries. LAC (Library and Archives Canada) is bringing the full service files of all military personnel who enlisted in the Canadian military in WW1 online. As of today, 110,260 of 640,000 files are available online via Soldiers of the First World War: 1914–1918 database. The Attestation papers have been available online for some time but the full service records were not. 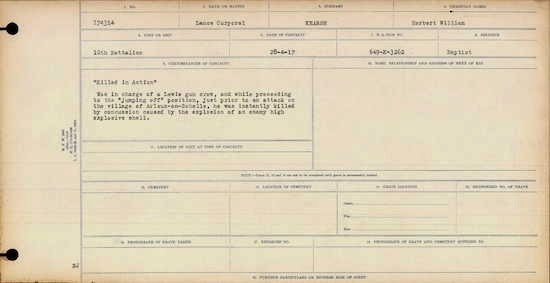 This is a wonderful addition to Canadian Military records. Olive Tree Genealogy has added to its Early Ontario Education Records a list of Teachers Receiving Pensions in Upper Canada 1857, Teachers Receiving Pensions in Upper Canada 1858 There are images with names of 298 Teachers with details of infirmity, years and locations teaching, age and residence who were being superannuated, or given a pension, in Upper Canada in these years. 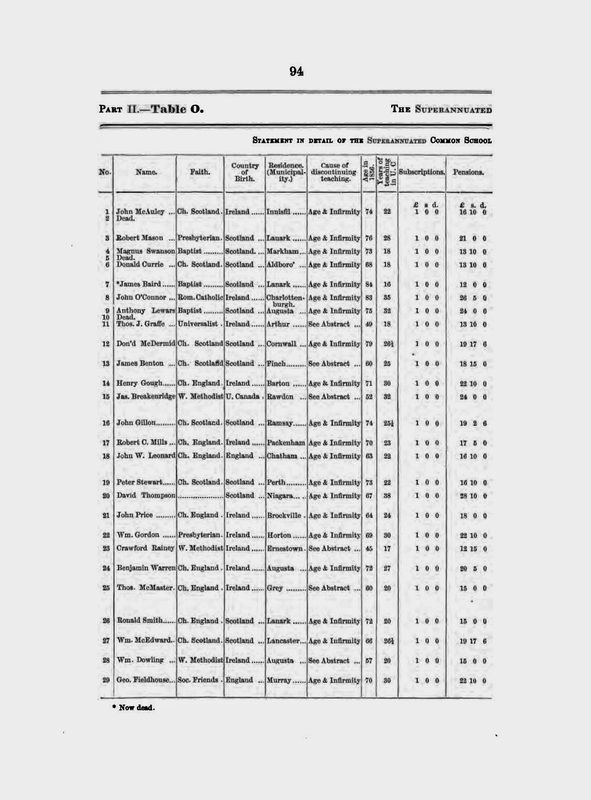 This adds to my earlier list of 120 teachers receiving their pensions in 1855. Each teacher is numbered and there are two pages for each entry. Find your name of interest and note the number beside the name. Then find the second page for that same number to read the details. I have transcribed the names from each image to assist researchers. As an example Teacher No. 20 is David Thompson, born Scotland and living in Niagara. He is 69 years old and has been teaching for 38 years. He started teaching in 1815 and taught in the counties of Frontenac, Lincoln and Welland in Upper Canada. Pains from wounds received in the War of 1812 forced him to retire. Each thumbnail can be clicked on to view a larger image. To assist researchers, I have transcribed the names found on these pages. 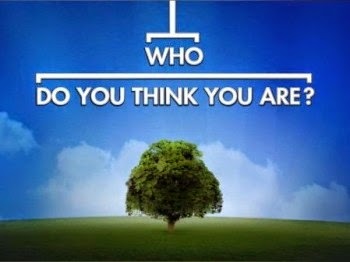 Who Do You Think You Are is gearing up to begin another season on February 24, 2015 at 10/9 central time. Lisa Kudrow visited The Talk to promote the newest season of Who Do You Think You Are? Julie Chen, who brings the series to China for the first time ever and learns about her grandfather’s brave and generous contributions to his country. Angie Harmon, who meets a family member she didn’t know existed, and learns that her ancestor fought under George Washington. Sean Hayes, who travels to Ireland to learn more about his father’s side of the family. Bill Paxton, who reads captivating first-hand accounts of wartime battles in which his four times great grandfather was involved in the American Revolution. Rumours are flying that we will see Josh Groban and Melissa Etheridge as two more of the new celebrities. Today I decided the time has come to sort, scan and organize my physical photographs. I have thousands. Some are older family photos going back to 1900 from my mother, her sister, my aunt and my mother's cousin. Some are my family photos from when I was a child, and others are from my life since 1970. I also have my personal collection of CDVs, Cabinet Cards, tintypes, ambrotypes and daguerreotypes. I estimated I have over 3,000 of those. To start with I am concentrating on my family photos. You can see most of what I have in the photo on the left. As you can see currently they are tossed into plastic tubs but I want to store them in archival quality boxes. The first thing I did this morning was take a look to see what sizes of photographs I need to store. That allows me to determine the size of boxes I need and make an estimate as to how many will be required. Then I started making my plan. First - I decided what my goal was for these photos - what is the final outcome I want? I know I want to eventually scan them all so I need one box for unscanned photos. Some have been scanned already and those are already sorted into tubs so that will be fairly quick to get into archival boxes when they arrive. Any plan for organizing photos will depend on how you want to store them - by family groups? By time periods? By names of the person you are going to give them to? The choice is personal. I want to give some of mine to my adult children as soon as possible, others I want to keep for my grandchildren when they are older and some I want to hang on to myself. I decided I needed 8 boxes to hold 4x6 photos, 1 box for 8x10 and 1 box for 11x14. With the 4x6 boxes I will have one box for photographs for each of my grown children, one for recent photographs I don't want to part with yet, one box for my life as a child growing up with my parents, one box for my maternal grandmother's family and one for my maternal grandfather's family. When my boxes arrive I will sort the photos I have already scanned and get them put away. Scanning the photos not yet scanned will be something I do in bits and pieces over the coming months. Next week I will create an organizational plan for my personal collection of mid 19th century photos and share that. I still have to create a plan for my digitized and scanned photos so I will work on that later this week and share it here on Olive Tree Genealogy blog. 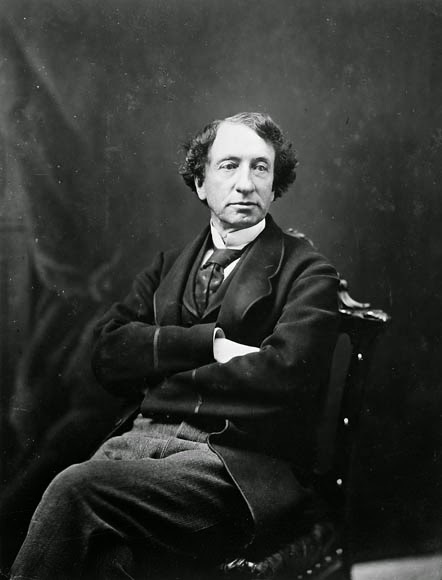 Library and Archives Canada (LAC) has an extensive and varied collection of records related to Sir John Alexander Macdonald, including a virtual exhibition that includes personal papers, photos, artwork, and publications. Within LAC’s Sir John A. Macdonald collection, there are over 100,000 letters to and from family and close friends, which gives researchers a rare glimpse into his personal life. Sir John A. Macdonald’s image has been used in political cartoons, commercially in beer advertisements, as an endorsement for tomato chutney, and he has even been made into an action figure. Sir John was the leading force behind Confederation in July 1867 and he left a legacy of greatness in his political career spanning almost 50 years. 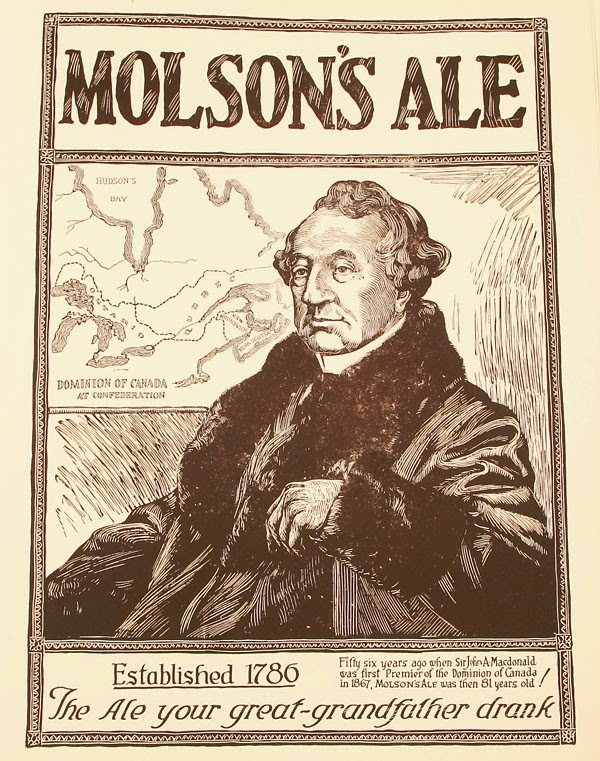 Source: Molson Companies Limited, Montreal, Quebec. Political Junkie Café—Success. Scandal. 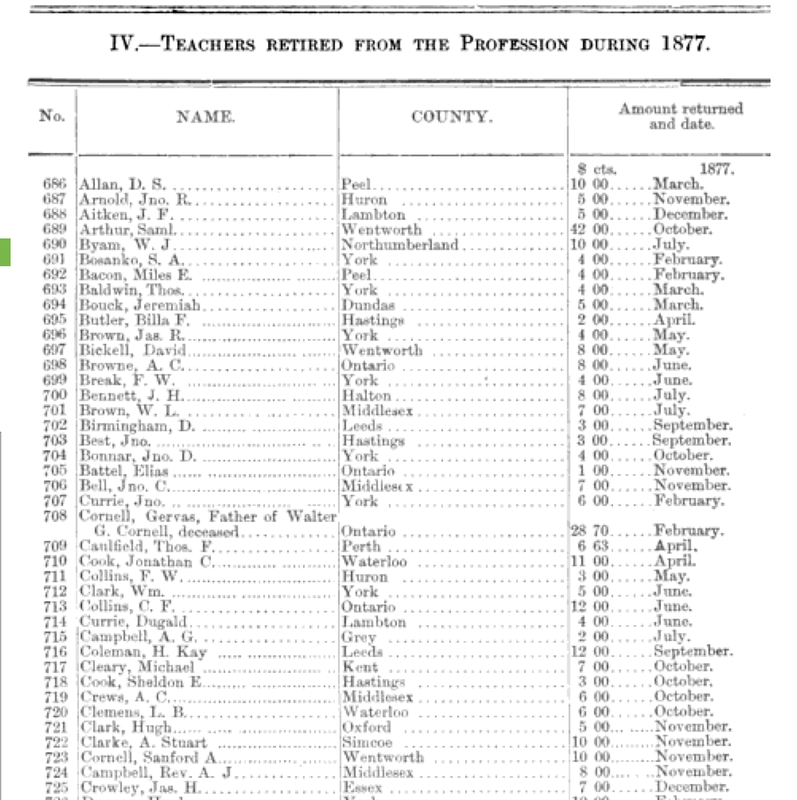 Sir John A.
Olive Tree Genealogy has added images and a list of 120 teachers who were being superannuated, or given a pension, in Upper Canada in 1855. Each teacher is numbered and there are two pages for each entry. Find your name of interest and note the number beside the name. Then find the second page for that same number to read the details. I have transcribed the names from each image to assist researchers. As an example No. 1 is John McAuley, born Ireland. His religion is Church of Scotland and he lives in Innisfil. He is 74 years old, suffers from age and infirmity and has been teaching in Upper Canada 22 years. His pension amount is given. The next page for No. 1 shows that he was a teacher for 50 years, he taught in W. Gwillimbury, Essa, Tecumseth and Innisfil. He was a teacher in Nova Scotia from 1817-1830. Thomas McMullin Who Are You?